INS Sindhuvijay, a Sindhughosh-class submarine. The Sindhukirti‘s original upgrade process was scheduled for three years, but was eventually delayed for years beyond its original deadline. Reporting on the matter last fall, India’s Business Standard found that the cause of the delay wasn’t logistical inefficiency or bureaucratic mishandling—two common afflictions for Indian defense endeavors—but rather due to a series of incremental extensions of the upgrade process by Russians working with India’s Hindustan Shipyard Limited (HSL), the shipyard in charge of the upgrades. India’s Sindhughosh-class submarines were co-developed between India and Russia’s Rosvooruzhenie, a state intermediary company under Rosoboronexport—Russia’s primary agency for managing defense exports. 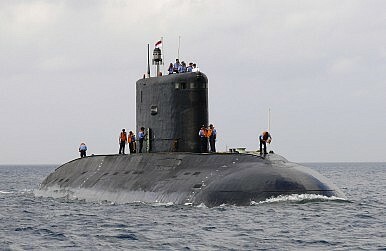 The Sindhukirti‘s refit, unlike the Sindhughosh and Sindhudhvaj, two other submarines in the same class, “involved extensive modernisation,” in excess of the other refitted Sindhughosh-class submarines. As The Diplomat has noted in the past, India’s submarine force faces several shortfalls. It currently operates just 13 aging diesel-electric attack submarines, with just half of them fully operational. When it comes to its submarine forces, the indigenously designed Arihant-class nuclear submarines are a feather in India’s cap, but even that project was delayed. The Indian government recently cleared an additional $8 billion in funding for naval modernization, part of which will go toward the constructio nof six additional nuclear submarines. India currently operates one Russian Akula-II-class nuclear submarine, leased in 2011 for a ten-year period. India’s experience working with Russia on the Sindhukirti‘s upgrade process highlights the growing difficulties the two countries are facing in working together on defense projects. As the United States appears poised to permanently succeed Russia as India’s top arms provider, New Delhi and Moscow continue to have their disagreements over defense cooperation. For example, most recently, India and Russia have tussled over co-development issues related to their jointly developed fifth-generation fighter aircraft (FGFA) project.